Under contract to the California Department of Water Resources (DWR), Aspen Environmental Group prepared an Environmental Impact Report (EIR) for a proposal to change the seasonal flow release schedule of Pyramid Dam, located at the southern end of Pyramid Lake in Los Angeles County, California. The purposes of the project were to (1) improve habitat conditions along 18 miles of middle Piru Creek for the federally endangered arroyo toad (Bufo californicus), and (2) avoid the incidental take of this species due to the operation of Pyramid Dam. 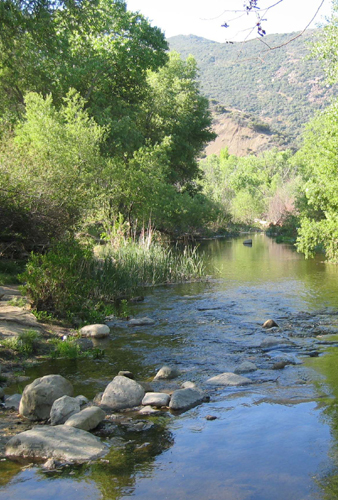 With the exception of a few private in-holdings, middle Piru Creek is surrounded by the Los Padres and Angeles National Forests and is primarily used for recreational purposes. Although middle Piru Creek falls within the administrative boundaries of the Angeles National Forest, Pyramid Dam and middle Piru Creek are part of the California Aqueduct Project, which falls under the jurisdiction and management of DWR and the Los Angeles Department of Water and Power, as licensed by the Federal Energy Regulatory Commission (FERC). The EIR evaluated 16 subject areas, with emphasis placed on biological resources, water resources, cultural and paleontological resources, and recreational fishing. Key issues identified in the EIR included potential erosion damage to infrastructure due to peak flow releases, potential flooding risks to people and infrastructure due to peak flood releases associated with either extreme storm events or dam failure, and potential reductions in opportunities for trout fishing. In addition to evaluation of the proposed project, five alternatives were also assessed. Preparation of the EIR additionally included completion of the project’s Mitigation Monitoring Program, as well as completion of analysis correlating the content of the EIR to the content of Exhibit E of Title 18 of the Code of Federal Regulations Part 4.51(f), as required to initiate the FERC’s review and approval of the proposed project. Concerns expressed during the public review process that were resolved and documented in the Draft and Final EIRs included potential impacts to the middle Piru Creek trout fishery, recreation, down-stream State Water Project water deliveries, erosion and flooding, and potential impacts to steelhead trout (Oncorhynchus mykiss) and southwestern pond turtle (Clemmys marmorata pallida). In addition to completion of the project’s environmental review documents, Aspen also prepared all CEQA-related noticing, including mailings, regional advertising in numerous newspapers and postings within the project area, all document distribution and filing, and the coordination and facilitation of all CEQA-related public hearings and meetings, including the preparation of meeting presentations and reference materials.